표제에서 서궐(西闕)은 경복궁(北闕)의 서쪽에 있는 궁궐, 즉 경희궁(慶熙宮)을 의미한다. 1620년(광해군12)에 영건된 경희궁의 원래 이름은 경덕궁(慶德宮)이었으나, 1760년(영조 36)에 경희궁으로 개명하였다. 은 이 경희궁의 전경(全景)을 그린 그림으로, (국보 제249호)와는 달리 채색이 가해지지 않은 밑그림 형태로 전해지고 있다. 경희궁은 1829년 여러 전각이 화재로 소실되자 1830년 중건을 시작하여 1831년 완성하였는데, ·서궐영건도감의궤(西闕營建都監儀軌)·를 통해 중건에 관한 자세한 상황을 알 수 있다. 이 의궤와 을 비교하면 부분적으로 차이가 발견되어 은 중건 이전의 모습을 담고 있는 것으로 생각된다. 이 은 수묵으로만 그리는 백묘(白描)의 계화(界畵) 양식으로 그린 것으로, 먹 아래에는 밑그림이 남아 있는 부분이 있다. 산수 묘법과 나무를 그리는 수지법에서는 비수(肥瘦)가 있는 필치로 회화적 표현이 두드러진다. 건물은 자를 대고 윤곽선을 명료하게 긋고 있으며 각 건물의 지붕에 이름을 써 넣었다. 대부분의 전각이 이건, 변용, 훼철되어 버린 경희궁의 옛 모습을 한눈에 살필 수 있을 뿐만 아니라 정밀하고 자세한 묘사로 복원의 토대가 되는 중요한 그림이다. 또한 작화 과정의 일단을 짐작할 수 있는 밑그림이란 점에서도 주목된다. Western Palace refers to Gyeonghuigung Palace, which is located west of the main Gyeongbokgung Palace. Gyeonghuigung was built in 1620 (the 12th year of King Gwanghaegun’s reign). It was originally named Gyeongdeokgung, but was given the present name in 1760 (the 36th year of King Yeongjo’s reign). 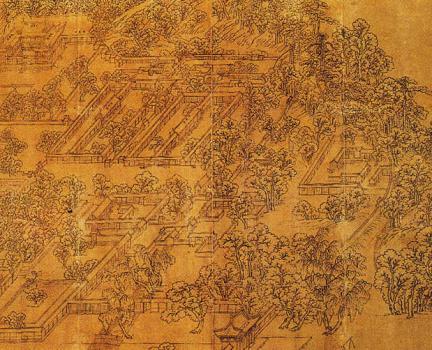 This uncolored line drawing provides a full view of the palace complex but markedly differs in style from the more famous Donggwoldo (The Eastern Palaces), which is National Treasure No. 249. Gyeonghuigung as depicted in this painting partially differs in appearance from that in the Protocol of the Office for Construction of the Western Palace, which documents repairs on the palace undertaken in 1830 to 1831 after many pavilions were lost in a fire in 1829. Hence, the painting is assumed to have been produced before those repairs. The painting was executed mostly with fine outline technique, with traces of under-drawing remaining here and there. 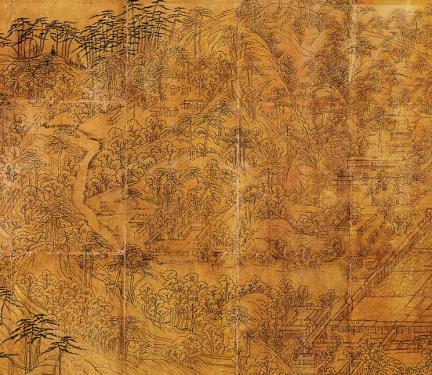 Mountains and trees were skillfully depicted with lines of different thickness to achieve a painterly quality, though to a limited extent. The buildings were painted in clear straight lines using a ruler, with the names written on the roofs. Now that the palace has been seriously damaged with many pavilions moved or transformed, the painting will be a useful reference for reconstruction. It is also worthy of note as a draft work, offering a glimpse into the painting process.